The following constitutes the field operations rules and policies of the Loveland Propbusters RC Club. It is the responsibility of each club member to be familiar with, abide by, and enforce each of these provisions. As an Academy of Model Aeronautics ("AMA") sanctioned club, the Loveland Propbusters shall abide by the AMA safety code. These additional rules are added to cover specifics of our field and flight environment. If there are conflicts between this code and the AMA safety code, the AMA safety code shall take precedence. All operations at the field must be conducted in a sportsman-like manner and in accordance with club rules and current Bylaws, Field Operations Policies, and AMA safety code. A copy of the Field Security and Flight Operations Rules will be maintained in the large green equipment locker located just west of the runway/spectator area. We operate under a permit from the US Corp. of Engineers in the spillway of the lake at William Harsha (East Fork) State Park. While the safety of all is the paramount concern, the possibility of losing our field permit at William Harsha state park is of equal concern. As a result, not all of the policies set forth below are specific to safety concerns. As stated above, each club member has the responsibility to both abide by and enforce these flight policies. Violations of this policy can result in the revocation of member status in the Loveland Propbusters RC club. The club member witnessing the incident should remind the alleged violator of the club flight policy. Every effort should be made to be non-confrontational. A pilot should not be confronted until after they have terminated their flight, returned to the pit area and turned both their radio and aircraft off. Distracting a pilot while in flight can only increase the danger to both people and equipment. The Safety Officer will gather information with regard to the reported incident. This will include a description of the incident as well as the names of all persons present at the time of the incident. Once the information is gathered, the Safety Officer can, after investigating and reviewing the information, dismiss the incident without further action. Any person found to not be abiding by the field operations policy or the AMA safety code, who causes a loss to another person's property shall be financially responsible for such damages. Should the Safety Board determine enforcement action or sanctions are necessary, the offending member will be notified in writing of the Safety Boards determination. If a member is asked to leave the club the return of club fees will be at the discretion of the Club Board. Aircraft Classifications - Rules defining the allowed aircraft types. Pilot Classifications - Defines the different pilot classifications. Flight Safety - Rules intended to minimize the risk of injury or loss of property. Flight Area - Defines the designated fight area at the field. Good Neighbor - Rules intended to minimize the risk of loss of field. Special Events - Special considerations that may be used for events. Non-Fixed wing glow-fuel powered (2-stroke and 4-stroke) aircraft (helicopter) not to exceed a 5' blade length. All aircraft are to be fitted with a proper exhaust and muffler system to minimize noise. - Pilot not qualified for solo flight of any radio controlled aircraft. These can be new pilots or new club members that have not yet demonstrated their flight abilities as defined below. These are Student pilots. - Pilot qualified for solo flight of sailplane/gliders/electric type aircraft only. These are Glider pilots. - Pilot qualified for solo flight of “basic“ fixed wing trainer type aircraft only. Pilot is not qualified for solo flight of high performance aircraft such as pattern, combat, or racing aircraft. These are Basic pilots. - Pilot is qualified for solo flight of non-fixed wing aircraft. These are Helicopter pilots. - Pilot qualified for solo flight of any fixed wing airworthy radio controlled aircraft. These are Fixed wing pilots. - Pilot qualified for training and assistance to any pilot (instructor). These are Instructor pilots. A pilot can hold multiple classifications at one time. For example, B and H or F and I. It is a member's responsibility to be aware of his classification. All flying with aircraft beyond the member's classification will require the assistance of at least a class “F“ pilot. Ideally a class I pilot should be utilized for assistance. Advancement to a higher classification will require two successful demonstration flights observed by at least one class I pilot. Demonstration flights must be conducted with an aircraft appropriate to the classification desired and require that the pilot only complete the maneuvers without loss of control of the aircraft in a safe manner. Precision is not required for any classification. 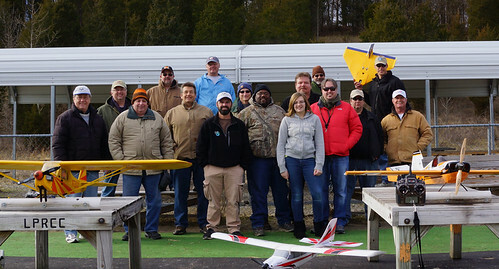 All members of the club must be classified by an instructor before flying any radio controlled aircraft. New members will be temporarily classified “S“ until an instructor determines that a higher classification is justified. Proper restraint of the aircraft prior to starting, and observing caution around running engines. Understanding not to stand in line with a spinning propeller, or holding an aircraft up in a way that could injure a pilot or spectator. Not to reach across the prop arc to remove glow igniters. Performing a proper range check prior to commencing the first flight of the day for each aircraft to be flown. The following rules apply to flight safety. The safety of people (pilots, spectators, and bystanders) should be the number one concern of any pilot. The safety of equipment should be secondary. Prior to the first flight of the day a range check should be done of all aircraft to be flown. 72 MHz transmitters must be placed in the impound station while not in use. A clothespin with pilot identification (Name) must be placed on the frequency board, at the proper frequency, whenever a transmitter is in use. Upon termination of a flight, the transmitter must be returned to the impound station. The pilot's clothespin designator can remain on the frequency board provided that no other pilot wishes to use the frequency. Note: A frequency is actually the specific Megahertz that are allowed to be used by FCC rules. The numbers listed on the frequency board are channels. When more than one pilot wishes to use the same frequency the frequency should be shared. Each pilot should be allowed a flight in round robin fashion. It is each pilot's responsibility to ascertain if other pilots are waiting for a frequency. When finished flying for the day, pilots should remove their frequency pin from the board prior from departing the field. Frequency pins left on the board can cause confusion and unnecessary concerns for the remaining pilots. A maximum of 5 aircraft (any permitted type) are allowed to be airborne at a given time. While in flight each pilot is allocated one of the 5 pilot stations. Pilots are to remain in the pilot station (cages) while in flight, especially, if there are more than one plane in flight. Pilots are not permitted to operate aircraft either from the pit area or east of the runway. Flying over the pit area or park access road is strictly forbidden. Please imagine a line that extends left and right down your pilot stations and never fly behind this imaginary line. This will help keep the airplanes in front of you and away from the pit area at all times. Take-offs and landings of all aircraft must be announced for all pilots to hear, and must be conducted on either the asphalt or grass runway. No takeoffs from the taxiways or pit areas are permitted. Aircraft requiring "hand launches" should be taken onto the active runway and launched into the prevailing wind in accordance with the preferred takeoff direction of the time. The launcher should clearly announce their intentions to the adjacent active pilot stations, and minimize their time on the runway area. While not the preferred method, pilots launching their own aircraft by hand, should abide by the previous stated guidelines. Touch-and-goes, low passes and other runway-impacting flight activities must be announced for all pilots to hear. Dead-stick landings or other situations requiring an immediate return to the runway should be clearly announced. "Dead-stick", "coming in" - or "I do not have full control" should be loudly spoken so pilots in adjacent pilot stations can be made aware of a potentially dangerous situation. When a "Dead-stick" or other immediate landing requirement is announced, those pilots with other aircraft in the air should climb to a safe altitude and orbit the field until the dead-stick aircraft is down and the runway area is clear. Due to the recent increase in low level 3D flying, and the possible dangers of such, the pilot should enlist the help of a “caller”, who stands behind him/her to warn of people, horses, other planes, etc. This is not necessary when at altitude. All spectators must remain behind the fence separating the pits at all times. All small children must be accompanied by, and under the control of, their supervising parent or guardian. All persons either entering or leaving the field area must announce their intentions prior to crossing the runway area so that pilots are aware of pedestrian traffic. Pets are permitted at the field provided that they remain in the spectator area and properly restrained. No alcoholic beverages are permitted at the field, in accordance with the East Fork Park Rules.